Yesterday was the 71st anniversary of the bombing of Pearl Harbor, the Day of Infamy that would propel the United States into the Second World War. It was a day of heartbreaking losses — 2,402 dead, 1,177 of them on the USS Arizona alone1 — and the deaths that would follow in the weeks and months and years of the war would stagger the nation. But one comfort shared by my mother’s family and others who lost loved ones in that war has to be a sense that the lives lost were not lost in vain. That something real, and tangible, and precious, was protected and saved by their sacrifice. That comfort, for my more extended family, has not always been the case. And I could not help but think of the contrast when thinking of one branch of the family tree, and the woman born 202 years ago today. Julia McGimsey was born 8 December 1810,3 and lived her entire life near the mountains of western North Carolina. In all, Julia bore 12 children. The others were, in order, John F., born 4 October 1841; Joseph B., born 21 February 1843; Theodore P., born on 9 December 1844; America A., born on 18 June 1846; Elizabeth J., born 17 October 1848; Phebe Louisa, born 4 June 1850; and Charles F., born 12 October 1852.10 They lost little David Martin, the baby of 1840, when he was just two years old,11 but the other children grew to adulthood. And I cannot imagine how Julia felt as she surveyed her four beautiful grown boys as the winds of war swept into western North Carolina and the Confederacy sounded its call to arms. But, like so many other families, after North Carolina seceded from the Union, these Bakers answered the Confederacy’s call to arms. One after the other, all four of Julia’s grown sons entered into military service on behalf of the south. (The baby Charles was far too young even at war’s end.) And, one after the other, three of the four perished. 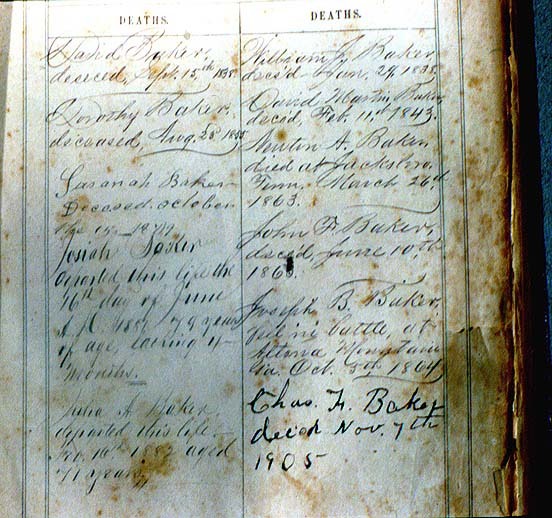 The oldest, Julia’s first born, Newton, only recently married 14 and a new father,15 died at Jacksboro, Tennessee, on 24 March 1863.16 He was not yet 27 years old. Julia didn’t even have three months to grieve Newton’s loss before her second oldest son, John, died of fever, on the 10th of June, 1863.17 He was just 21 years old. That left Joseph and Theodore both in service… and the agonizing fear of yet another loss. The rest of 1863 passed. And most of 1864 as well. And, the family Bible records: “Joseph B. Baker, Fell in battle at Altona Mountain, Ga. Oct. 5th 1864.”20 Joseph was just 21 years old. Of Julia’s four Confederate sons, only Theodore made it home. And you can’t help but wonder… As the South lay in ruins, as families struggled to come to grips with the unspeakable losses of that war, as Julia looked at the empty places around her family’s table… what comfort did she have? Could she possibly have felt those lives were not lost in vain? How did she cope? We recently had the opportunity to view a re-enactment movie in the Vicksburg Battlefield Visitors’ Center. Even though I have no direct ancestors who even participated in the Civil War, that movie still brought tears to my eyes as I imagined all the suffering and loss, No, “I can’t imagine” how they coped. I can’t either, Margie. I don’t have a clue. My husband, Maj Ralph M. Dryden, Jr was killed in Viet Nam when my daughter was 10 years old. We had spent fewer than 6 years together. The loss never goes away. All any of us can is thank you and your daughter for your husband’s service, Lee. And salute you for your courage in dealing with his loss. Lt Col Courtney Dryden Rogers USAF), daughter of Maj R M Dryden, was just elected State Rep. of TN, District 45. She has had an outstanding military career and is venturing onto new avenues. And we thank HER for her service as well! You must be so proud. Thank you for this beautifully written–and sobering–post, Judy. The sacrifices of the Civil War generation, like the World War II generation, stagger the mind. How wonderful that the Baker family Bible has survived to help preserve the memory of this family. Thanks, Shelley. It is sobering to think of the losses folks suffered… heartbreaking. And yes, the Bible entries are terrific. They start with my 4th great grandparents! Of course that’s the only line I have that in, but at least it’s one! Writing about our ancestors brings them to life … there is more to them than just names & dates & places. The Civil War … unfortunately even today, still divides us. This is partly due to misunderstanding what drove Southerners to secession. Too many want there to be one simple answer, but as source 13 makes so clear, Southerners were not of one mind on the issue. Thanks, Keith. But don’t be so quick to dismiss that “one simple answer.” The primary and predominant cause driving the Southern politicians to secession was slavery — primarily the economics of slavery. The official debates and statements of the time make that abundantly clear. Once secession was a fact, of course, Southerners who had no dog in the slavery hunt often joined for the honor of the South (and because conscription was very widespread very early). But let us not fool ourselves about what drove the secession votes in the legislatures of the South: the biggest cause was in fact slavery.